A holiday can be ruined if your children’s favourite pet is not allowed to join you. While sometimes this is unavoidable, there are times when taking the family dog is the right thing to do (leave the snake at home). If you are travelling on a long-haul flight, taking a pet along for the flight is not the brightest of ideas. But if you are planning a driving holiday, or will be away for the bulk of the summer, you might want to take your pet along. Dogs are far and away the best animal travelling companions when it comes to car journeys, as cats will need to be put in a cage or special carry bag, and may even need to be sedated. Some dogs, however, experience frequent motion sickness, and may require special medication you can purchase from your vet beforehand. As looking out a car window increases the chances of sickness, some people prefer their dog travels in a special crate. If you choose to travel with a dog, make sure he has plenty of water and frequent rest stops. You may want to not feed your dog for several hours beforehand to reduce the risk of sickness, or invest in waterproof seat covers. Keep the window open at least a crack to allow fresh air in, and take changes of clothes for you – just in case. Taking a dog on a (domestic) flight is an expensive option, but some people weigh up the cost of a kennel and choose this option instead. 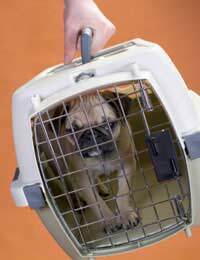 While small dogs are occasionally allowed to fly in the cabin in a small crate, larger dogs must travel separately. You may need a certificate from your vet to ensure he is healthy – always check with the airline first before booking your flight! If you are travelling abroad, you will need to know whether your animal will require a quarantine or not, and what vaccinations are needed. Many people find going on holiday with their dog just isn’t worth the time and effort – they only travel abroad with Rover when they are moving to another country for good. Many hotels are not animal-friendly, so don’t expect to find everywhere you go. You will need to book accommodation in advance of your travel. Remember also that you will almost definitely have to leave your pet alone from time to time. Can you take Fido to the hotel restaurant with you? Probably not. If he will howl when left alone in the hotel room, you’ve got a problem. Don’t expect all your friends to be welcome an animal with open arms. Some people have pet allergies, others just don’t like domestic animals. Avoid confrontation by asking whether your furry friend is welcome or not. Some children want to take other small animals, such as hamsters or gerbils, with them on holiday. This can make sense if you are making the two-hour drive to Grandpa’s house for three weeks. It might be a bad idea, however, if you are flying to Bermuda for 10 days. Ask your host’s permission first, even if Honey the hamster never leaves her cage. Some people are a bit squeamish about rodents. Take enough food, animal litter etc. with you. If Gran or Grandpa lives in a remote village, finding the right accoutrements may prove difficult. Taking pets on holiday is sometimes – but not always – the right thing to do. It all depends on the type of pet you have, its temperament, where you are travelling and what type of holiday awaits you at the other side. If your children can live without their beloved animals for a few weeks, the best thing might be to leave them in the care of loving friends. But if you are travelling close to home and it’s easier to take your pets than find a good caretaker while you’re away, then travelling with your pet might make sense.